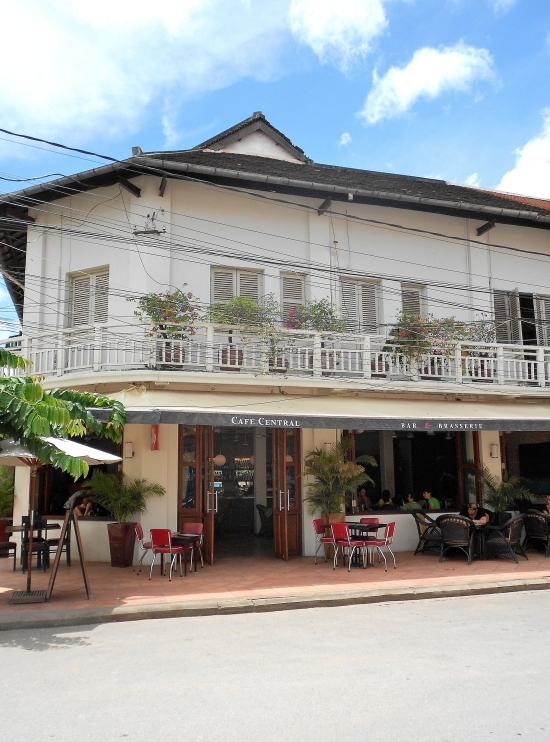 Cool and breezy Cafe Central occupies the ground floor of a classic cream-coloured colonial building on a commanding corner spot opposite Siem Reap’s Old Market. Set midway between the slow flowing river and one end of the town’s celebrated Pub Street, the location is hard to beat. With shady terrace seating outside, and deep red retro diner-style banquettes beneath tall bi-fold windows inside, the Central is perfect for people watching as well as enjoying breakfast, a morning coffee or a full meal. A large serving of colonial-urban-chic for breakfast, lunch or dinner please. The interior is a relaxing blend of old colonial — with whirring ceiling fans, lush leafy parlour palms and comfy wicker armchairs — and industrial chic. The service counter is polished steel on top of a shiny concrete base. A collection of simple Rothko-style canvases hangs on walls of exposed red brick above polished tiled floors and chill-out music completes the calming vibe. A cute, glass-domed cookie stand, full of home-made brownies, reminds you that this hip little venue is all about food, not just about looking good. Breakfasts range from a simple tropical fruit salad with Cambodian honey and yoghurt for $3.00 or two eggs, any style, with toast at $2.50 to eggs Benedict with cooked ham and hollandaise sauce for $5.50 or a huge, no holds barred cooked breakfast for $5.75. Mugs (yes, real mugs) of tea start at $1.00 and a range of excellent Illy coffees are available from $1.50. Freshly squeezed juices and smoothies start at $2.50. The rest of the menu is extensive enough to satisfy even the most diverse group of travellers’ tastes but not so big that you feel faint with hunger before managing to plough through it all. Main meals are a mix of Western and Cambodian and are served by casually uniformed staff who are efficient, polite, and speak decent English. 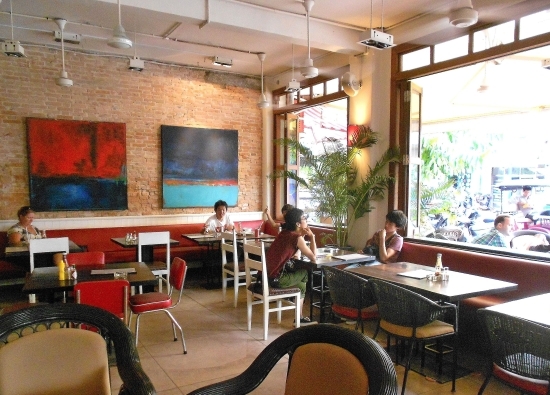 The spotlessly clean Cafe Central is a good place to sample Khmer cuisine if you are not on a tight budget and are not quite ready to try what’s on offer from the street vendors or market stalls opposite. Let “The Central” lure you away from the more… ahem…”exotic” aromas of The Old Market opposite. I usually start with Cambodian fresh spring rolls (a bargain at $1.75) or share a refreshing tomato and basil bruschetta, with delicious little chive flowers sprinkled on top ($3.00). Then one of my regular main course favourites is lemongrass chicken skewers ($5.25) — pieces of chicken breast marinated in fresh herbs served with vegetable fried rice. The Khmer vegetable curry with rice ($4.75) and beef lok-lak — spiced beef fillet with Cambodian peppercorns ($5.50) — are also excellent introductions to the local cuisine. Chicken schnitzel with coconut pumpkin puree ($5.50) and honey soy grilled pork loin with sweet potato and garlic mash ($6.50) are also as good as they sound. The only dish that has ever left me slightly disappointed is the cottage pie. Call me greedy but while the taste was definitely up to standard, the portion was a little on the small side. For lighter meals there are sandwiches and paninis: A simple cheese, tomato and oregano toastie will set you back $4.25, or a slightly more decadent beef with onion jam and tomato panini is yours for $5.75. A range of burgers, pizzas, pasta dishes and salads start at $5.25. The Central’s beer list includes the usual suspects at OK prices — but this is not somewhere to come if you want to get tanked up on cheap beer, let’s face it — but the standout drinking options for me are cocktails for $3.00, champagne cocktails for just $4 (I am very partial to a kir royal) and wines by the glass from $3.25. Bottles start at $15 for a decent house red or white — which is about average for this kind of place in Siem Reap. They also serve iced water, for free, with your meal–– although you may have to ask for it — and they put your wine in an ice bucket for you. Classy all round.